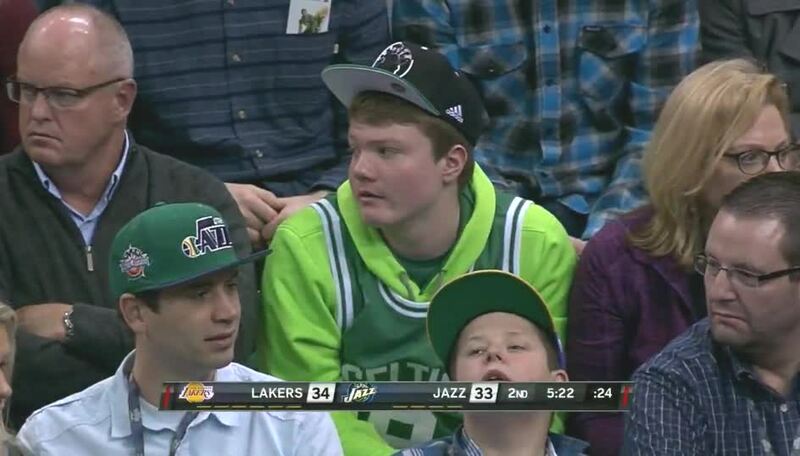 I try to keep Gordon [Hayward] and all our starters’ minutes, you know, between 30 and 35. I just believe that that’s the best way to help our team and to help them. I mean, you want guys to be fresh when the game’s on the line, and you also want ’em to be fresh at the end of the year. And you want ’em to be healthy two years from now. And I think all those minutes over a period of time add up. He’s sitting in some film sessions, and just having his voice and you know, it’s important. I think, you know, the fact that he wanted to be around, and you know, a lot of guys in situations like this will just, you know, it’s completely understandable, will do their rehab somewhere else, or, so to have him here with our group right now, I think it’s good for him and it’s good for our team. I think that’s just like a resemblance of like a 7-footer coming over, you know, trying to block your shot. Sometimes [player development coach] Lamar [Skeeter], he even blocks my shot with the paddle, so that helps me out a lot, you know, finishing over the paddle. And you know, once I get in the game, it’s kind of like second nature because that’s what I’ve been working on so much lately. I’m pretty determined not to judge this team based on wins and losses right now. I just, I think, I’d like to continue to use a different way of evaluating our success. And again, it’s a by-product for sure, you know, but as we’re talking to our team, you know, we won tonight, but there’s some plays that were, like, horrible plays, where we fouled shooters and we fouled at the end of a shot clock. We fouled when they were in the bonus. Like, you know, in another game, a closer game, that happens, we lose. And we played really well at times, but we foul and it cost us a game. Well, so it gets, I think, particularly with a group that’s trying to improve, you gotta really identify those areas where you need to get better and just focus on, you know? And clearly, defensive, you know, I think our activity and things defensively was an area that, you know, we weren’t very good. We hadn’t been together that long. We had some guys individually that I don’t think took enough pride in it themself. They may never be great defenders, but can be good team defenders. It’s a long answer, but I think you get the idea. He’s improving. When he’s playing pick and roll in the middle of the floor, he’s more conscious of finding people. I know he had, you know, he had a number of, you know, he had 19 shots, but you know, I thought he was unselfish. You know, when you’re a player that’s capable of scoring, and that’s what’s been asked of you for a long time, being able to find that balance, you know, is a process. And I think that’s where he is. It was a couple passes he threw tonight that he should feel really good about. And you know, the other thing we want from him is for him to defend, and I think his activity on the ball is improving too. We ask him to do a lot. I think the biggest challenge for him right now is, I’d rather have him do less on offense and more on defense. And he knows that. I think when he’s engaged, he’s capable of having those nights. I think Gordon, when Gordon feels like he’s got a little groove shooting, and people aren’t tight on him — they play him for the drive — he shoots the ball, he’s gonna get some games like that. You know, but I think his strength as a player is the balance of his game offensively. He’s able to do so many things and get people involved, and you know, tonight the jump shots were there and he was making ’em. It’s been a big help. You know, Trey’s a guy, you know, he can play pick and roll, he can shoot the ball real well, he can get into the paint and dish, and you know, that help me out on the post. And you know, when I get the ball in the post or whatever, they come down and double or help, you know, I find him at the 3-point line or slashing to the basket and he get his buckets that way. So it’s a good [combination]. Yeah, I, definitely. You know, our team needs me to be aggressive, to try to help us score on the offensive end. And whether that’s, you know, playmaker, getting other guys open or scoring myself, you know, I need to make sure that I’m aggressive. I think it’s slowed down a lot. You know, the most important thing is I’m not predetermining–you know, coming off the, coming off pick and rolls, I’m really just making plays based off of how the defense is playing me. And coach Quin, he’s complimented, complimenting me every day, telling me I’m getting better at making reads and things like that. So, I just gotta continue to grow. Yeah, it’s, definitely. You know, it’s a little tough. That’s, I’m still figuring that out all the way, ways I can just get everybody else involved. You know, get into the paint and you know, get everybody involved. But coach always tells me, man, just take what the defense gives you. You know, if the, if your pull-up j[umper] is there, shoot it. If it’s not, you know you have someone else open. So, as a point guard, you have to be able to make those type of reads. I got, I was thinking about, you know, pacing myself, but after that, you know, I just went after it. You know, went to the boards a little bit and tried to mix it up. Craig Bolerjack: There’s a Celtics fan…Sorry, Boston’s about, what, 20, 2,000 miles away? ** Quin Snyder on the Lakers’ front court, shootaround: Between Jordan Hill and [Ed] Davis and [Carlos] Boozer, they’ve got a lot of activity down low. ** Trey Burke on working in the paint, shootaround: I think I’m just getting more comfortable in there. I’m slowing down when I get in there. You know, I’m making, you know, better decisions, you know, whether the shot is there or if it’s for my teammates. 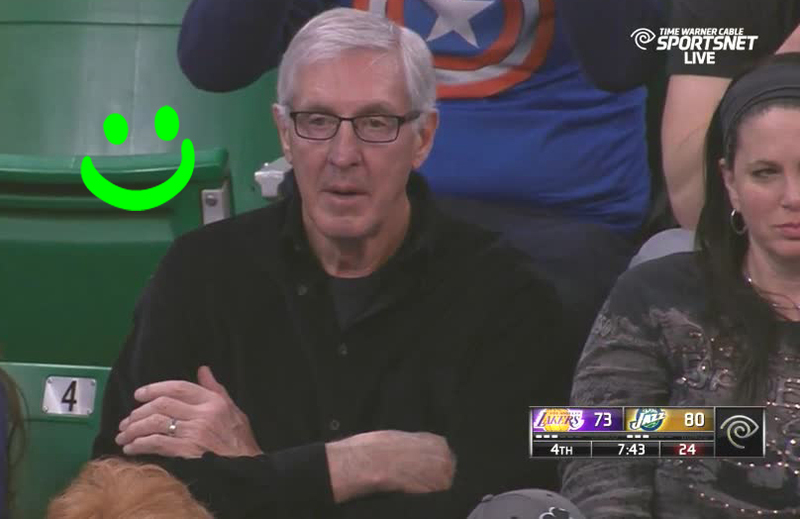 ** Woman staying at the Ronald McDonald House: Having somebody like Derrick Favors behind you, I think really helps elevate you and your spirits. 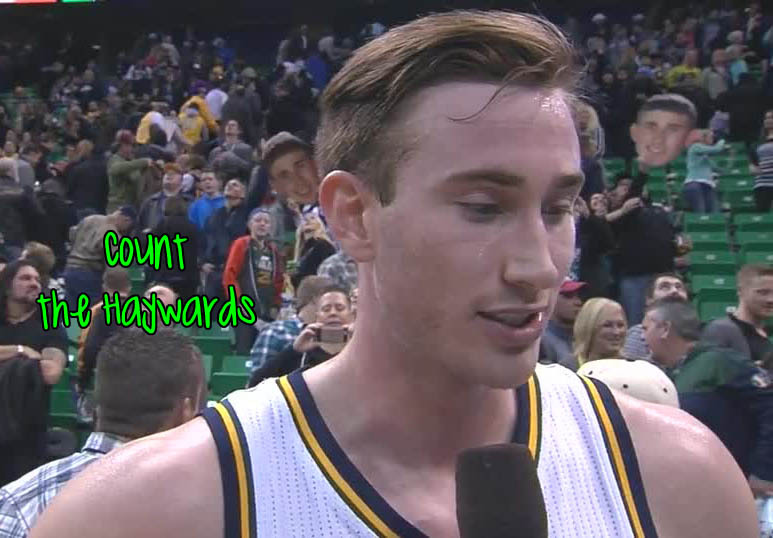 ** Matt Harpring on Gordon Hayward: Gets into the teeth, and finishes. ** Craig Bolerjack: Boozer on a wiggle, stripped by Gobert! ** Harpring on Jordan Hill shot: It doesn’t look good, but it goes in. And that’s the bottom line. ** Harpring on Joe Ingles shot: You can’t leave Jingles in the corner, though. That’s a money shot. Thanks to @dianaallen for the assist on the W-L record tonight. Not sure if you already knew but when Kanter did that its him praying/thanking Allah. He finally knocked down a shot after missing like 8 in a row so its him sort of saying ”Thank God”. I think he does that when first stepping onto the court at the beginning of games maybe too.